So your at work and you really want to watch that YouTube video your buddy sent you. But you can’t cuz YouTube is blocked. Well I’m here to show you how. This builds on a previous post I did about listening to Pandora in Canada. Your using the socks proxy we setup before but you still can’t watch YouTube clips because their being blocked at the DNS level. Nothing we can do about that right? Wrong. Lets configure Firefox to send DNS requests over the socks proxy. There by circumventing the DNS blocks at work. In Firefox type about:config into the address bar. Now type dns into the filter. 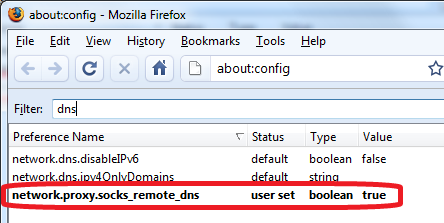 Double-click on the network.proxy.socks_remote_dns to configure Firefox to send our DNS requests through the proxy. Voila! We can now laugh it up watching YouTube clips to our hearts content.